Happy Friday! Today is a new challenge day over at SVG Cutting Files!! This months challenge is to create a project that is school or graduation related!! I had a friend at work that asked me to make a graduation card for her and she wanted a horse on it, challenge accepted!! Well really, I went running to Ann asking for an adorable SVG and wa-la! She busted one out for me! 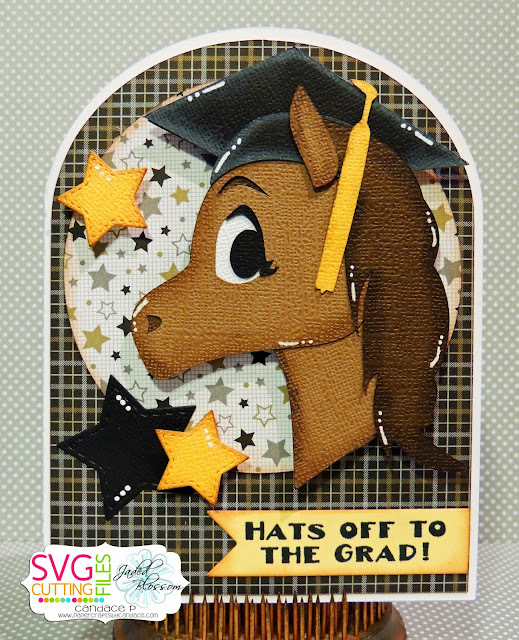 Here is my Adorable Horse graduation card! The graduation horse is NEW in the store now. I also used the Arched Top Card Base. From Jaded Blossom I used "The Graduate", Star Dies, and Flag Dies 2. Thanks so much for checking out my project! Make sure to check out all the other projects over at SVG Cutting Files! Wow, I really like this!! Super fun design and awesome papers! Clever blend of two subjects! Bravo!